2016 award winners with university leadership. 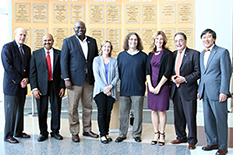 From left: Bruce E. Jarrell; Amitabh Varshney; Clement Adebamowo; Kathleen Stewart; Philip Resnik; Deanna Kelly; UMB President Jay A. Perman; and UMCP President Wallace D. Loh. The University of Maryland, College Park (UMCP) and the University of Maryland, Baltimore (UMB) celebrated the 9th Annual Joint Research and Innovation Seed Grant Program with a scientific seminar and reception held in the Jeong H. Kim Engineering Building at the College Park campus on Oct. 17. Part of the University of Maryland: Mpowering the State initiative, the seed grant program cultivates research collaboration across disciplines and between the two universities. "Development of an Implantable Device to Determine Cancer Cell Response to Chemotherapy in Real Time"
"A Non-Invasive & Cost-Effective Approach for Lung Cancer Screening"
"Use of Visualization Assisted Clustering to Detect Diverse Patterns of Disease Progression in Parkinson’s Disease"
"Nanotopographic Diagnostic Panel for Breast Cancer Metastasis"
"Development of Computational Modeling to Identify Symptom Changes in Schizophrenia and Depression"
"Geospatial Mapping and Access to Cancer Screening Services in Nigeria, a Low and Middle Income Country"
The University of Maryland Research and Innovation Seed Grant program has fostered creative teams of investigators working across disciplinary boundaries and campuses, supported new research foci and basic science tracks to pursue future health care improvements and technologies, and stimulated submission and funding of innovative basic and translational science research proposals to federal, public or private funding agencies since 2008. A total of 60 projects have been sponsored across six schools and colleges at UMCP and four schools at UMB, resulting in over 40 research publications, nearly 100 research presentations, and seven invention disclosures and patents. For more information, visit UMCP Division of Research and UMB Office of Research and Development.